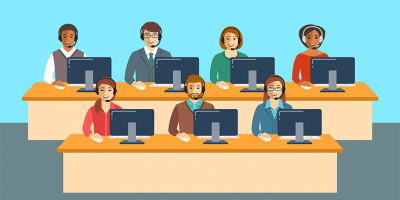 In a new CMO council survey, 52 percent of end consumers said the most important attribute of a brand experience is fast response times to issues, needs, requests and suggestions. So it’s no surprise that CMOs today are looking at every means to make the marketing function more agile and responsive to dramatically shorten time, reduce costs and ultimately become more responsive to their customers. But, traditional marketing analytics tools are not up to delivering the real-time, robust results you need in a world where the volume, velocity and variability of data has dramatically transformed. Never mind that building a traditional analytics solution can take more than half the length of an average CMO’s tenure. In this post, I break down the reasons why legacy marketing analytics tools aren’t enough when it comes to delivering the results CMO’s demand and what you can do to overcome their limitations. 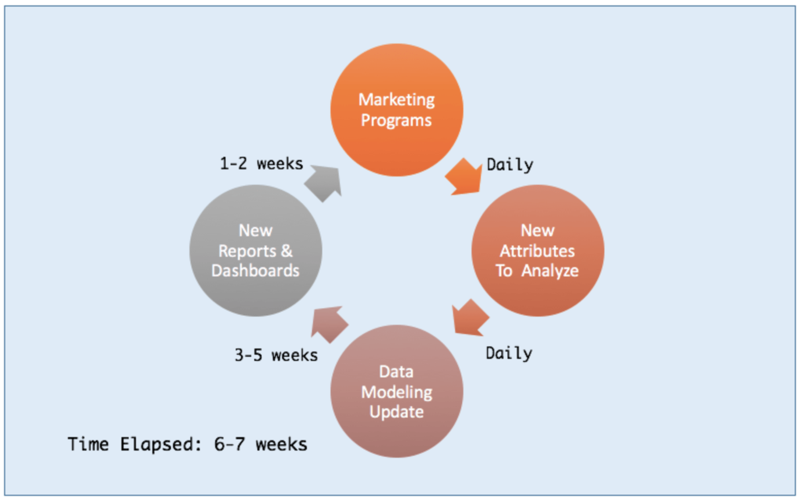 But first, let us peel back the traditional analytics model to understand those limitations a bit better. 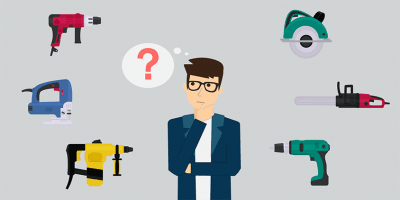 What are Traditional Marketing Analytics Tools? 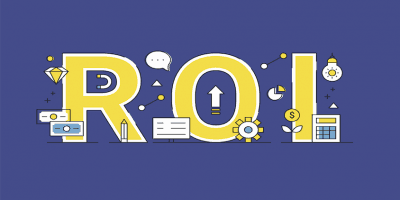 Marketers today are challenged to deliver ever more personalized, differentiated messages to customers and yet deliver higher than ever ROIs on their marketing investments. Achieving this herculean task requires bringing together all the different pieces of customer data available to a company in a unified way, in the moment, to create a unique, compelling message delivered to the customer in a contextual manner. This kind of advanced analytics requires powerful applications and high-performing data environments. Most companies have been limited in this endeavor by budget, technology, and lack of skills. However, a recent survey by Dun & Bradstreet and Forbes Insights found that most companies have yet to make those investments. For the past several decades, marketers have relied on data warehouses to store and analyze data extracted from operational systems for reporting and analysis. The process starts with identifying relevant data sources, cleaning and standardizing data, then setting up the metrics and developing reports that marketers want. Since data comes from a variety of discrete sources, it first needs to be cleaned, standardized and then loaded into the right tables through a process known as “extract, transform and load (ETL)”. After completing the ETL process, the business defines key metrics they want to track, and the attributes needed to analyze these metrics. 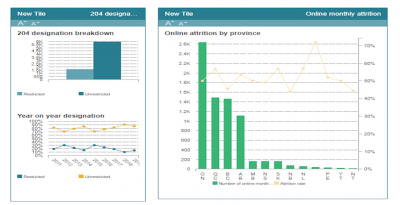 Reports are then developed that capture these KPIs. All these steps are sequential. 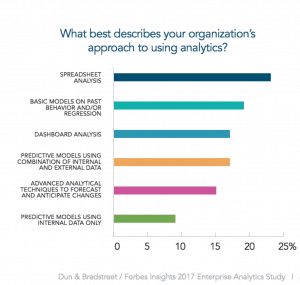 The traditional analytics model is a mammoth effort, time consuming, costly and requiring specialized skills of IT data analysts, but one that is increasingly inadequate to deliver timely results with the exponential growth in the volume and velocity of data. The number of customer touch points and the volume of data produced by each has exploded in recent years. 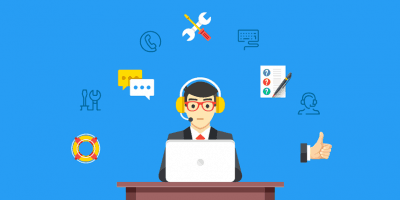 Websites, social media, point-of-sale systems, call center systems and new IOT data sources (smart home devices, connected TVs, wearable technology devices etc.) are all generating massive volumes of data, often continuously. This data deluge is commonly referred to as ‘Big Data’—a term for data sets so large or complex that traditional data processing application software is inadequate. Big Data creates huge challenges for businesses. Apart from requiring enormous quantities of in-house processing power to analyze data at scale, marketers grapple with other challenges, like how to capture and store it in real time, as well as how to search, share, query, or update data. 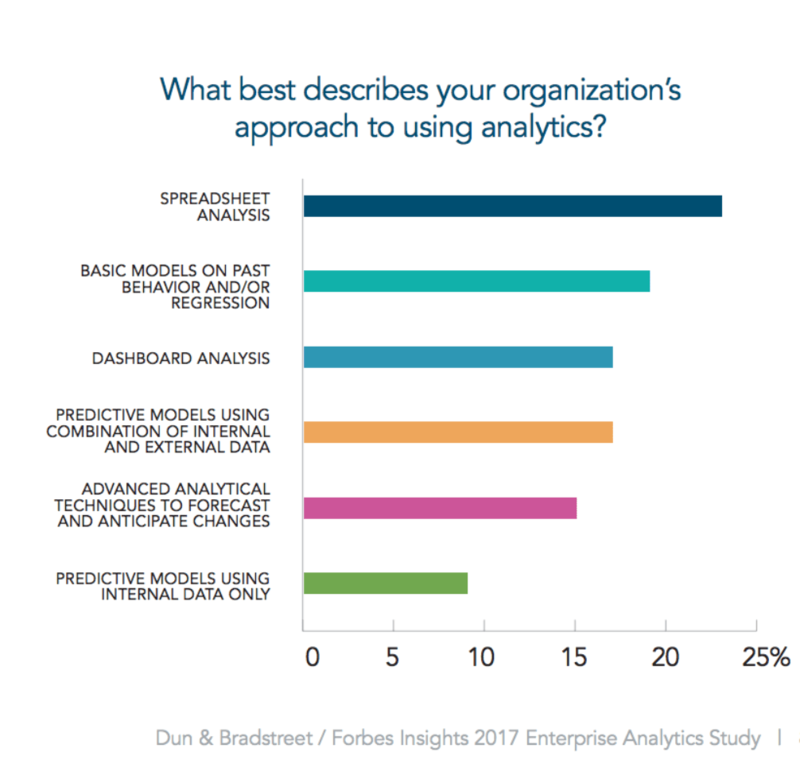 Despite this growth in data, the Dun & Bradstreet and Forbes Insights survey found that there has been surprisingly slow growth in use of sophisticated analytics. The static model I described above is inflexible, making it difficult for businesses to adapt to new product lines, new markets or changing sales processes. This makes some analytical applications outdated within weeks of roll-out. Whether it’s incorporating a new data source, making changes to attributes within an existing data source, or adapting to a real-time change in business (e.g. a new product rollout or a business acquisition), the static data model often turns into a bottleneck. While it represents a good construct of the business at a point in time; when something changes, a static model can really slow down decision making. Not surprisingly, this type of a static model brings a lot of lag into the marketing process, forcing marketers to remain a step behind in acquiring and acting on latest customer data. There is, therefore, a real hunger for applications that can truly enable decision making in real time, instead of having to wait days or weeks with traditional marketing analytics tools. Often marketing, finance, sales and HR functions all make their own investments and decisions of tools, applications and IT infrastructure. When the business demands a rolled-up view, this integration becomes painful. This has important consequences for marketing. Marketers need a system which takes the pain out of dealing with a traditional, data warehouse-based approach. To quickly integrate data, match across different channels and create a unified customer view in real-time, requires a behavior-based approach. Journey analytics platforms can deliver on this promise. 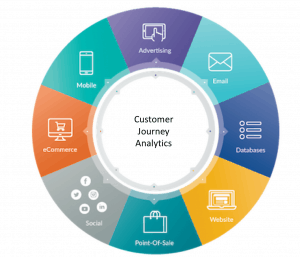 Journey analytics tools are designed to quickly integrate data across a variety of systems and channels to create a unified customer view. This allows marketers to analyze millions of data points in real-time and produce actionable analytics in a timeframe when it is still relevant and actionable. 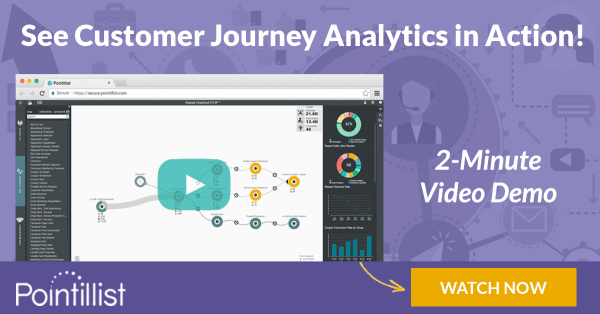 Customer Journey Analytics platforms integrate customer data from a wide variety of sources. Even if you’re confident your team can deal with the challenges of big data, a traditional data warehouse model, and time-consuming data integration, analyzing it in a practical and actionable way involves mastering advanced technical, statistical and analytical concepts. 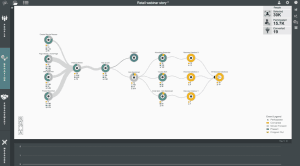 For instance, to query and extract data out of these datasets, users need to be conversant with programming languages like SQL, R or Python, and know how to manipulate data. To extract intelligent insights from data, teams of skilled data scientists are needed, who are often difficult to hire, retain and motivate. Does that sound like a skill the average marketer is trained on? The result? More delays and lags. 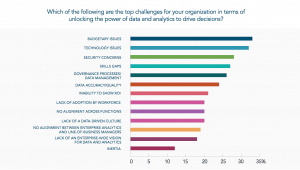 In the Dun & Bradstreet and Forbes Insights Analytics survey mentioned above, more than a quarter of executives identified skills gap as a major obstacle to their data and analytics efforts. However, an analytics platform that can make information easily accessible in a practical, quick and efficient manner goes a long way to alleviate this issue, and allow marketers to once again focus on relevant and critical customer-facing decisions. 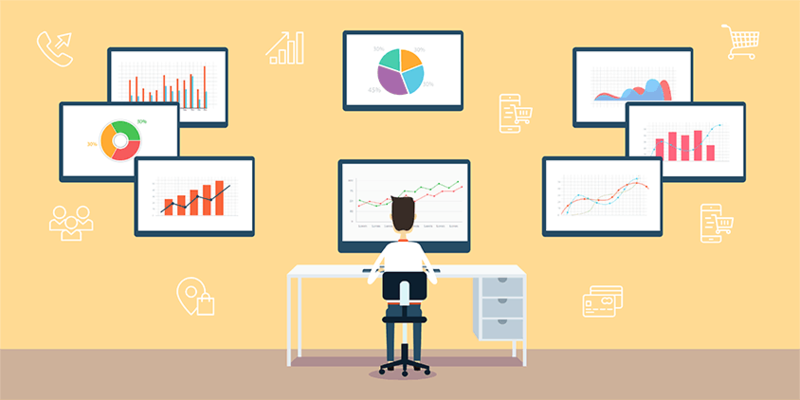 Advanced analytics applications can present complex data through visual journeys that do not require an army of data scientists to analyze. This results in faster campaign turnarounds, and ultimately, vastly improved marketing ROI. 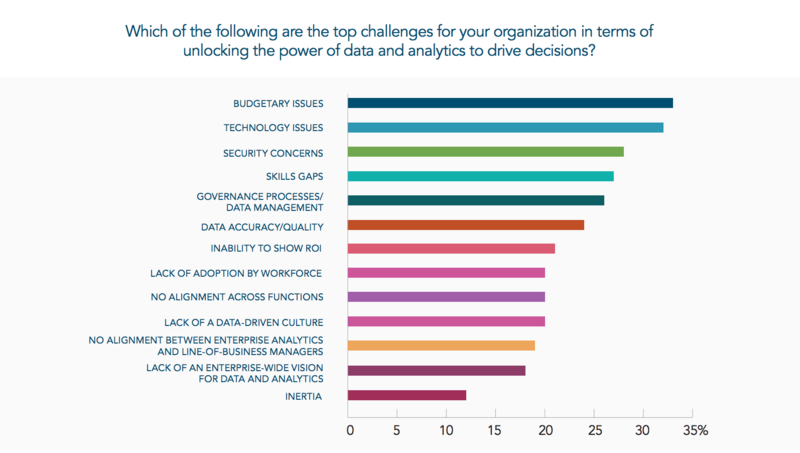 Traditional analytics approaches have another big challenge that is often overlooked. A static data model offers a historical lookback view, which is useful for analyzing trends and performances over time. But marketers today need to know what’s happening with customers prospectively and adjust the experience in real time. The historical view is thus rendered useless even before it is implemented. Most ‘real time’ claims aren’t so much real time as ‘near real time,’ which introduces a delay of 24-48 hours. Moreover, most analytics systems do not have direct integration with marketing technology systems to trigger personalization and influence customer behavior when it matters. A retailer wants to launch an up-sell campaign for its most valuable in-store customer to turn them into repeat, online customers. 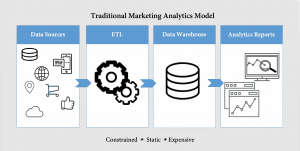 Operating through a traditional analytics model, a marketing analyst queries the marketing data warehouse to identify the most high-value customers . The results of this query are then matched against POS data to create a targeted list of customers who made a purchase in the last month and use them for a repeat purchase campaign, where eligible customers get an offer through their preferred channel. What’s your best guess at the time such a process might take? A few days or even a few weeks? 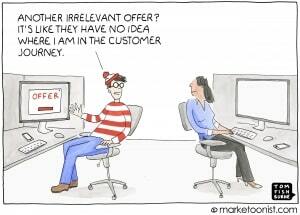 When the customer finally receives the offer it may no longer be particularly relevant or timely. Your customers expect personalized experiences driven by their current preferences and recent interactions. 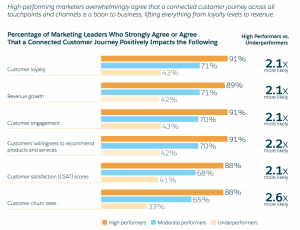 To provide each customer with a personalized experience based on their own unique preferences and personal journey, marketers need to connect millions of data points and analyze customer journeys as they happen. Customer journey analytics platforms are designed to make this possible. They enable marketers to identify opportunities for real-time engagement based on a deep analysis of customer behavior. They give you the power to identify at-risk customers before you lose their business. They let you connect the dots between customer interactions and business outcomes in seconds, rather than weeks and months. Customer journey analytics platforms can spot meaningful behavioral patterns in real-time, even among anonymous visitors, so you can engage each customer with a timely, personalized offer. In addition to providing a means for monitoring customer behavior in real time, customer journey analytics platforms enable marketing and CX teams to automatically engage with each customer at the best time, through their preferred channel and in a relevant, personalized way. By embedding triggers at any point in a journey, you can engage with each customer via their preferred channel (e.g. email, SMS, in-app message) in real time. And journey-based triggers are a lot easier to manage and more effective than rule-based systems of the past. Today, customer journey analytics platforms integrate with commonly used marketing automation tools, so you can engage with your customers through your existing marketing technology stack. The outcome is an enhanced performance level for marketing and CX campaigns through significantly better precision, targeting and timing. Most analytics tools work independently on data within a single channel and do not capture complex, multi-channel journeys. For instance, a digital analyst in a marketing team, would use a web analytics platform (such as Google Analytics) to measure traffic to a website or app, acquisition sources, behavioral flow and content engagement. A social media analyst in the same team may be using a dedicated social analytics tool to measure reach, engagement, sentiment, sharing and other social metrics. While useful, this traditional approach only helps to understand channels in isolation and gives an aggregate group view, instead of the individual, unique customer journeys across channels that are needed to build a complete understanding of customers for delivering real-time, personalized engagement at scale. That customer journeys are multichannel is a well established fact. New research by Harvard Business Review now reveals that the more channels customers use, the more valuable they are. This research found that after controlling for shopping experience, omnichannel retailers spent 4% more in-store and 10% more online than single channel customers, on average. In fact, with every additional channel used, spending increased in store. So, it is imperative for modern marketing analytics to be able to discover customer journeys across channels. Customer journey analytics builds a unified view of customers as they interact with your brand across multiple touchpoints. Using customer journey analytics, you can find cross-channel paths that lead to a desired action, as well as those paths that typically don’t lead to that action. Some customer journey analytics tools even use machine learning algorithms to uncover high-impact journeys and predict likely customer behavior. In a world where customers are one click away from abandoning their journeys, marketers need processes and use platforms that are powerful, elastic and automated, while at the same time require fewer technical resources. Marketers need to deliver measurably faster campaign results, with easily accessible technology at a significantly reduced cost. Given the limitations of traditional marketing analytics tools, marketers need to urgently rethink their model and the tools they are using so they can deliver effective marketing programs. 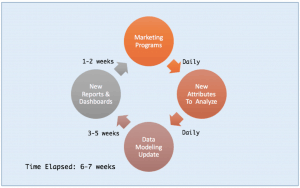 Customer journey analytics platforms make this an achievable scenario. Modern customer journey analytics platforms are built to aggregate and present data in an easy, practical and efficient way to facilitate engagement with your customers at the optimal time via the best channel. These platforms will enable marketers to truly harness the promise of big data and position them to stay in step with customer needs while delivering enhanced ROI.